The picture to the left is of Senator Claire McCaskill's field representative Brendan Fahey. 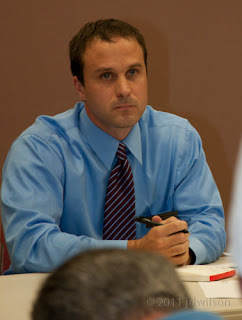 Fahey is listening to comments from constituents at Claire McCaskill's Kitchen Table Talk event held at St. Louis County Public Library on 31 Aug 2011. The picture was taken by JD Wilson shortly before he was assaulted. Well, Claire McCaskill (D-MO), you can expect more video cameras and voice recorders at future public events. The Democrats are running scared. It is my hope and prayer that McCaskill, who touted Obama, will be defeated in 2012. Their strong man tactics is reminiscent of Naziism ("Brown Shirts"). It is going to get brutal. Then she would be well-advised to charge admission the way Republicans do. As long as the TPs are intent on disrupting her campaign, she might as well get some campaign contributions from them. Is it your view that such events should not be open to media scrutiny? Do our public officials need to be shielded from public scrutiny? Yes. Some unions have been training their members in violent tactics. This is why you see people shoving Tea Partiers out of the room while screaming "stop pushing me." It's part of their training. dsm said: "Republicans charge for *campaign* events. This was *not* a campaign event, but rather something put on by McCaskill's in her capacity as a "public servant"
Not so. Paul Ryan recently charged $15 to attend one of his town hall meetings. Secondly, a Representative from the Cincinnati, Steve Chabot, (R), area recently had cameras at his town hall confiscated by the police. Frankly, I'd be suspicious of some guy in the crowd taking my picture. Why would he want to do that? Is he keeping a record of liberals so he can retaliate? In a "castle doctrine" state, that could be dangerous. A guy could feel threatened and shoot the picture taker. I think that may be legal in Missouri. All in all, the TPs at McCaskill's event got off easy. This McCaskill fiasco proves the cowardly measures our legislators are turning to in order to maintain the control they want over what we see and what we're told, and to cripple the blogosphere, which is the now the most trustworthy source of information on these puppet shows. "Seifert added that Ryan has nothing to do with the Whitnall Park Rotary Club’s decision to charge $15 for admissiona fee that will pay for the catered lunch of meat and potatoes the group will provide, club president Kent Bieganski told POLITICO." I've been to similar events in the St. Louis area for both Democrats and Republicans. This is a common practice. Chabot is an idiot. Having police officers confiscate cameras from citizens is truly appalling. Personally, I think he violated those citizen's First Amendment Press Freedom. Hopefully, he will lose in the primary by someone who won't bring the police state to their townhalls. I know you didn't really just suggest that Tea Partiers or any conservatives attending these Town Halls maintain an enemies list, pinned to their walls like some psychotic, planning a killing spree. Because not only is that an idiotic statement to make about anyone, but it is also extremely insulting and intellectually dishonest as Tea Partiers are the recipients of Town Hall violence. Additionally, do you even know what the Castle Doctrine states? At all? Or do you just inherently associate guns with violent nutjobs? The Castle Doctrine states that you have a right to protect your "castle" (i.e. apartment, house, mobile home) by force when an intruder forcibly enters and means you harm. How in the world could that possibly be misconstrued to infer that someone having their picture taken at a PUBLIC event would later kill the photographer? At all? And how would that remotely be legal to kill someone for the offense of taking your picture? And the assaulted Tea Parties got off easy? Are you serious? They got assaulted by a bunch of thugs for legally taking pictures, which is neither a crime nor an actionable offense. Are you being unintentionally dumb or intentionally misleading?